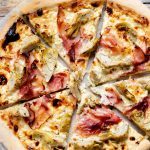 Prosciutto Cotto (ham) and jarred artichoke heart pizza on a cheesy mozzarella white base. A simple yet incredibly delicious pizza recipe. Preheat the oven to 200°C/400F/gas mark 6. Lightly dust two large baking trays with semolina flour, roll out the dough to fit the trays. You want them around 1/4 inch thick. Tear the mozzarella and layer it over the pizza bases, top with slices of ham and then artichoke hearts. The artichokes should already be quartered and then each quarter needs to be cut in half. Sprinkle over some parmesan then bake then in the oven for around 10-15 minutes until the cheese and melted and the dough is starting to turn golden brown.